"This is great to make your own croutons for your salads, etc. When you make your own you know what goes into it and you are proud of your accomplishment. You can also add your own flavorings." Remove crusts from stale bread slices. Brush bread on both sides with melted butter. Cut bread slices up into small cubes. Sprinkle with garlic salt (if desired). Arrange cubes on an ungreased cookie sheet. Bake at 350 degrees F (175 degrees C) for 15 minutes or until browned. Let cool. Store croutons in a covered container or plastic bag. Serve in soups or salads. 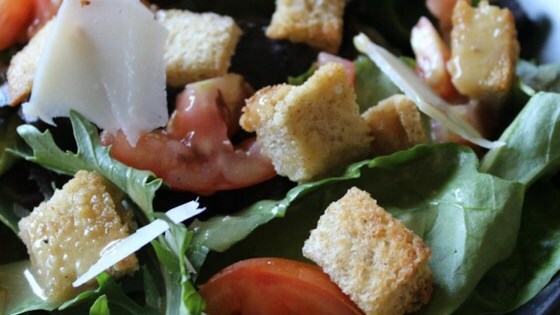 Watch Chef John make simple homemade croutons for salads and soups. A great way to use up bread that's past its prime! I like to use a lower oven temp so that the bread is crisp and dry all the way through before it starts to get too brown. I used Pam Butter spray on one batch and Pam garlic spray on another - then seasonings of my choice. The spray cuts down on the calories and keeps them crispy! Instead of buttering the bread directly, I poured melted butter over the sliced bread and mixed it well. It worked out great. Didn't take a lot of time. Wonderful! I will always make my own now--it's so easy! Mine were done at 10 minutes, though, so watch them.